Discovered in 1906, Alzheimer's disease still continues to claim victims and cause suffering. It is a neurodegenerative disease that destroys brain cells and causes memory and thinking disorders. Ted has Alzheimer's disease and his son Mac has decided to surprise him. Find out what happened! According to the National Institute of Health and Medical Research (Inserm), France today has nearly 900,000 people suffering from Alzheimer's disease. Globally, about 35.6 million people are affected by the disease, according to the latest report from the World Health Organization (WHO). What is Alzheimer's disease? And what are its effects and risk factors? Alzheimer's disease causes a gradual disappearance of neurons, which serve to sort and process information, as well as to program actions. By disappearing, these neurons directly influence our cognitive faculties such as memory, reasoning and language. Over time, people with this disease can no longer memorize or recognize people and objects. In general, Alzheimer's disease affects people over 65, but it is not a normal consequence of aging. The formation of amyloid or senile plaques due to the excessive production of beta-amyloid proteins and their accumulation in the brain. These plaques are associated with the destruction of neurons. Genetic and hereditary factors play a very important role in the onset of Alzheimer's disease. But this disease is also manifested by a combination of risk factors, such as aging, hypertension, cardiovascular disease and even exposure to toxic products. Alzheimer's disease does not only affect the life of the person affected but also that of those around him. This is the case of Ted and his son Mac. A father-son duo to fight Alzheimer's! Ted McDermott, an 80-year-old Briton, has been suffering from Alzheimer's for years. His illness is progressing and his condition is deteriorating day by day. But his son Mac discovered that when his father sang, his memories came back and he was recovering his memory for a few minutes. Mac created a Facebook page on which he posted videos of his singing father. 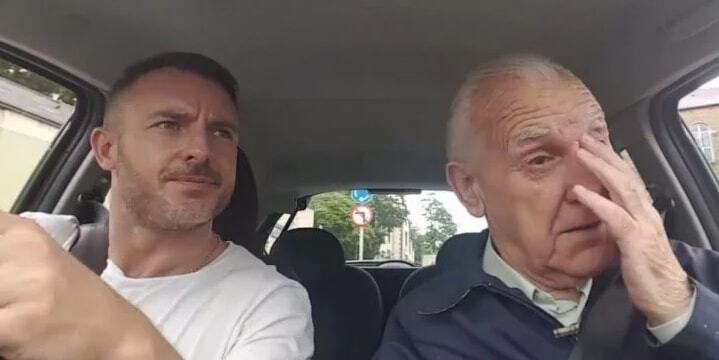 The last video published, gathering the two men in the car, shows how Ted regained his memory thanks to the song. With his strong and impressive voice, Ted has always loved singing and remembers perfectly all the songs he hummed despite his memory loss. Through music, a part of him and his personality came back to life and he found all his joie de vivre. Mac did not just share his father's photos and videos, but he also launched a fundraiser for the Alzheimer's Society. This story can be inspiring for families of people with Alzheimer's disease and it's also a way to shed light on this disease.